Do you have a favorite family member who loves to read? Do you have trouble finding “just the right book” for them for birthdays or holidays? 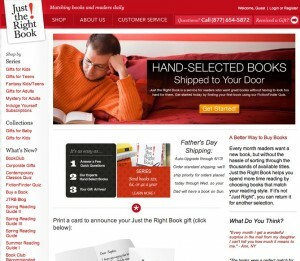 Just The Right Book – an inventive service started by R.J. Julia Booksellers in Madison, CT is designed to help you out with your gift dilemma. When you use Just The Right Book for a gift, you give the booksellers information about the reading tastes, likes and dislikes of your gift recipient. Then, depending on the gift package you buy, Just the Right Book will mail a gift-wrapped book to your recipient 4, 6, or 12 times the following year. Books are chosen by booksellers who are passionate about books, read hundreds of books a year, and are eager to figure out the perfect book for your gift. Also, Just the Right Book offers a great baby gift for newborns – a carefully selected baby book collection and a great beginning to your new reader’s library. If you’re struggling to figure out the perfect book for a gift, keep Just the Right Book in mind.